This breakthrough technology does not use heat or any kind of “invasive” process. Instead it triggers the body to convert light energy into cell energy without thermal heat. LED light therapy is non-invasive, causes no inflammation, and requires no special post-treatment procedures. 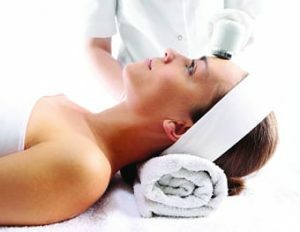 LED Light Therapy is an effective treatment for aging skin, rosacea and other skin conditions. You will see a reduction in fine lines and wrinkles, overall redness, age spots and sun damage. What does LED light therapy benefit? What is a LED facial? It is a technology based skin treatment that uses specific wavelengths of natural light energy to restore skin’s normal, healthy activity. The energy delivered by the LEDs enhances cellular metabolism. This stimulates the body to build new collagen, increases circulation and improves the functioning of the lymphatic system. The result is younger, healthier looking skin. The LED facial will take about an hour. During your initial series, each treatment takes about 30 to 40 minutes. Maintenance treatments are important in order to maintain your visible results. Once a month is recommended. Your skin care specialist will determine what is best. Your skin will look different after the first treatment. It will be smoother and more hydrated with a natural, radiant glow. The most visible results are not immediate, instead they will occur gradually over time within several weeks. With each treatment, you will see improvement. You can resume regular daily activities right away and start to see some improvement immediately. You can put on makeup and go out in the sun right away. There is no downtime with this treatment.